I use them all the time! 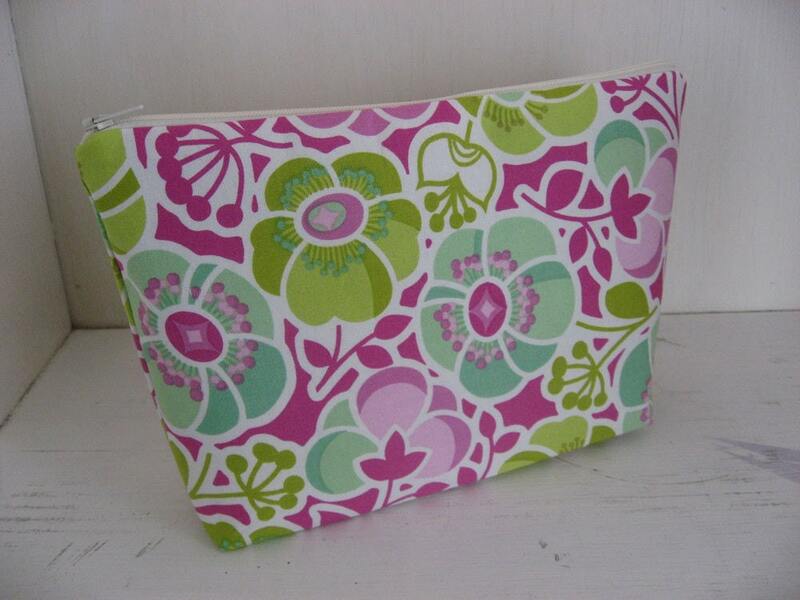 The zippered cosmetic bag is perfect for keeping all of my must haves contained in my handbag. 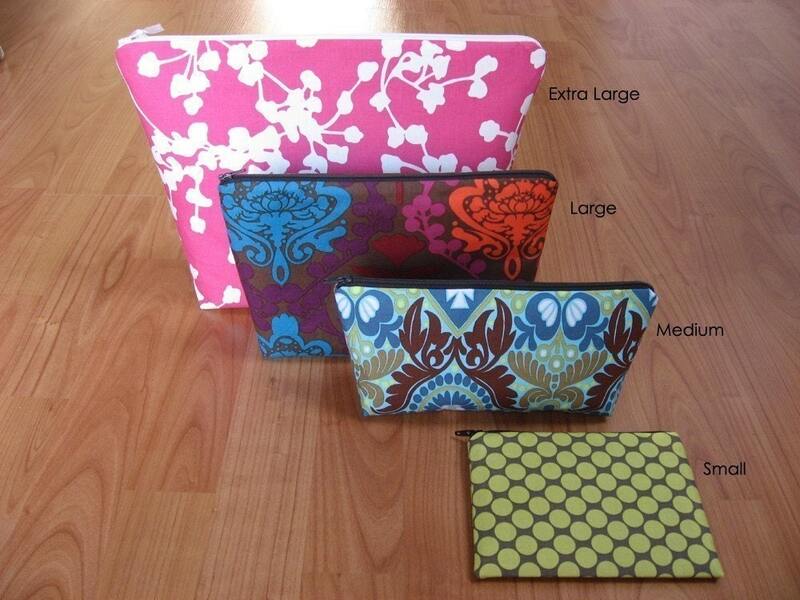 And they come in four sizes so you can choose the one that's just right for you. 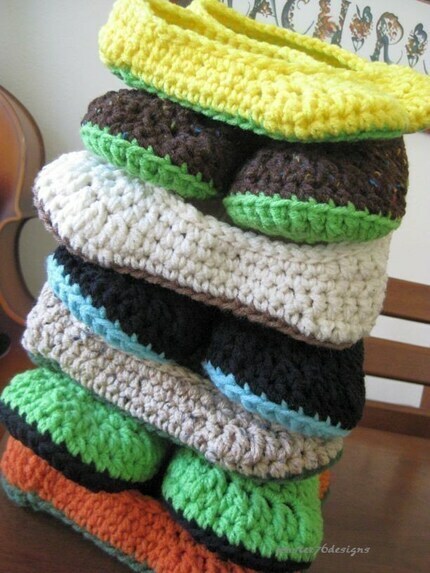 You can even get one with ruffles! 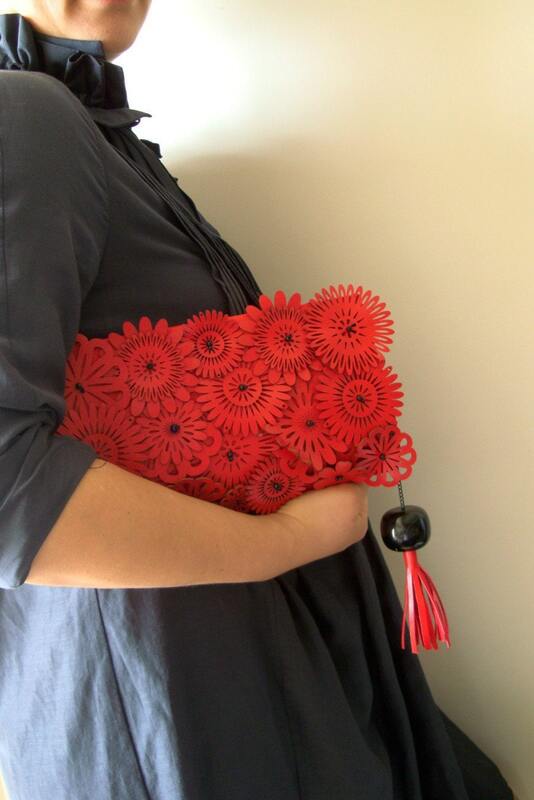 Speaking of, I also love the ruffled clutch bag. 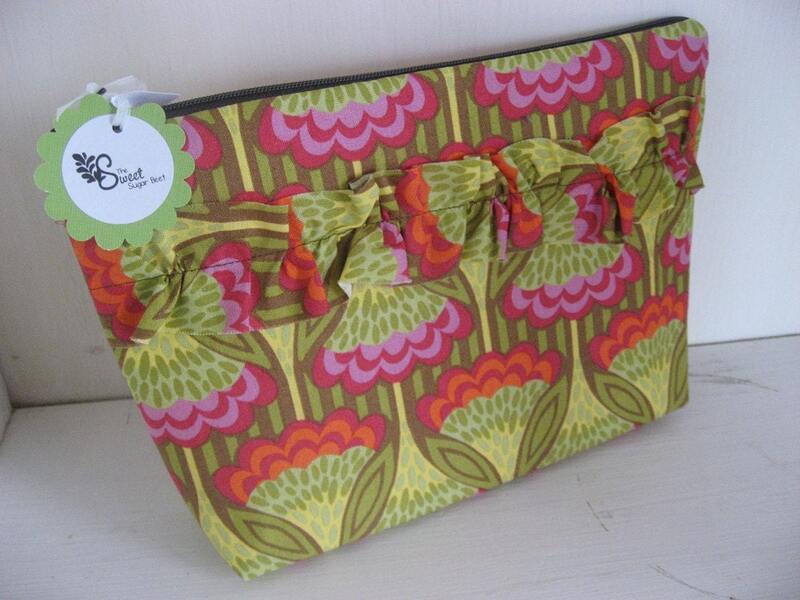 Even the "plain" clutches from The Sweet Sugar Beet have some sass. And they all have great contrasting linings. There are so many fabulous fabric choices to choose from that you can work with Haley, the store's owner, to design something totally unique. Believe it or not, nothing I posted here costs more than $16! So whether you're buying something for yourself, a friend or someone who won a Super Bowl pool (thanks Jamie! 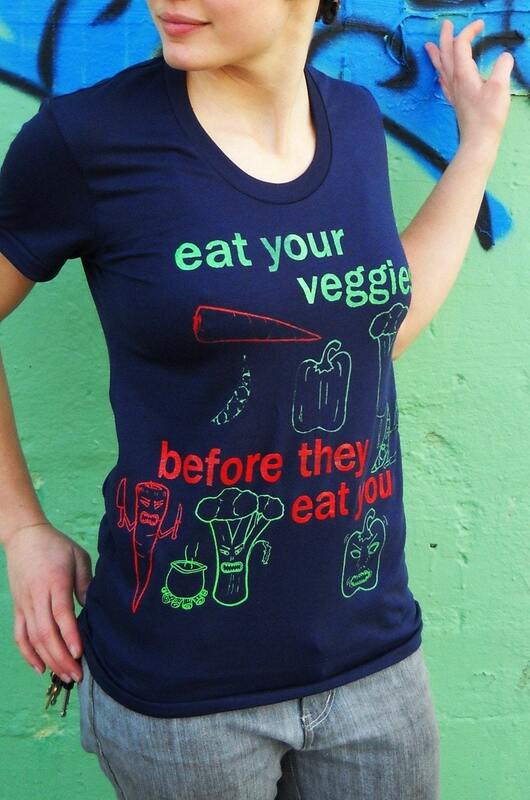 ), The Sweet Sugar Beet has a treat for everyone on your list. And one lucky AFOMFT reader is about to win a treat of their own because The Sweet Sugar Beet has graciously offered to give away one large cosmetic bag right here! 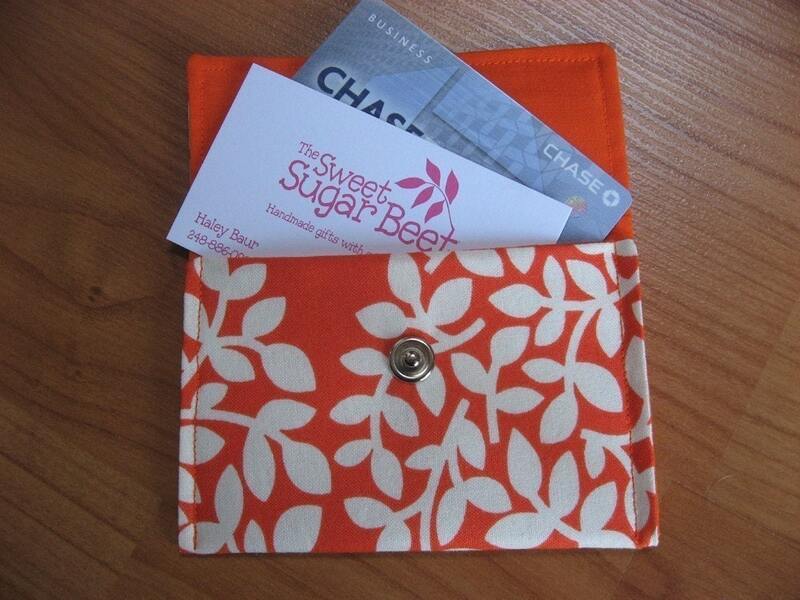 Visit The Sweet Sugar Beet on Etsy and make the store a favorite. Grab the MOM MADNESS MONTH button and put it on your blog or website and post a link here showing us. Blog about AFOMFT, MOM MADNESS MONTH or this giveaway (worth 2 entries so please post two comments) and post a link to the post. Please leave a separate comment for each entry (two if you've blogged about the giveaway) and make sure to include a link to your tweet, blog post, etc. This giveaway is open to residents of the U.S. and Canada and ends April 1st at 11:59 pm EST. The winner will be selected by random.org and announced on AFOMFT on April 2nd. If the winner doesn't contact AFOMFT within 48 hours, a new drawing will be held so be sure to check back to see if you've won! But that's not all! The Sweet Sugar Beet is also generously offering readers of AFOMFT free shipping on all orders through April 1st! Just enter the code AFOMFT in the message to seller box at checkout and you'll receive a refund via Paypal when your item is sent out. Now what could be sweeter than that? I posted the other day about some of my favorite combinations - chocolate and peanut butter, leather and lace - but there was one that I missed - modern and vintage. You're probably thinking, "What? 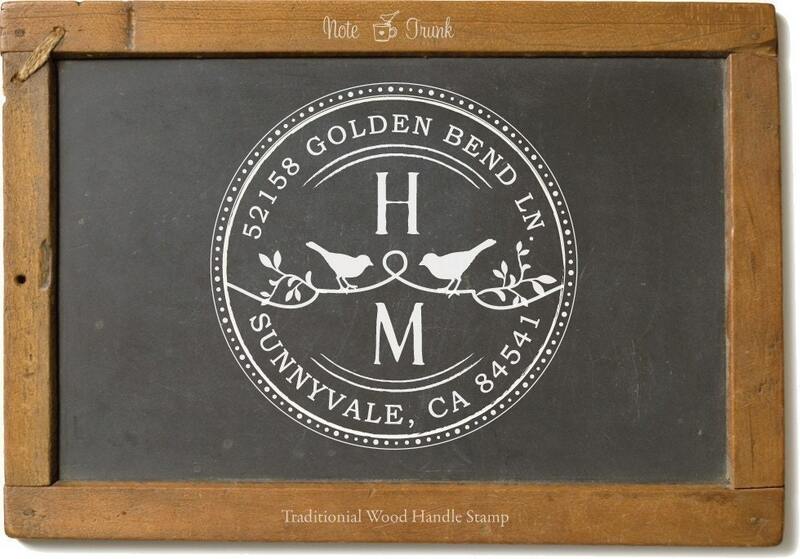 Modern and vintage are opposites so how can they go together?" but trust me. 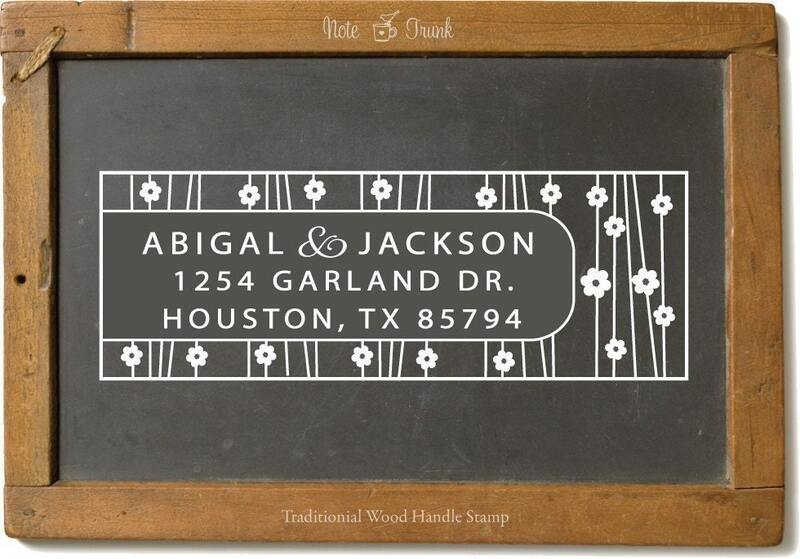 There's a reason why opposites attract, and the fabulous wood handle stamps from Note Trunk are the perfect example. That's right. You can get a contemporary return address from this old-fashioned hand stamp. But they feature some delightful designs too. The sleek Hyde Street option is one of my favorites. The Parcel Express version is old school with a modern twist. The Flag Banner would be perfect for my kiddos. And the Organic Bird on a Box and Two Birds circle are wonderfully whimsical. 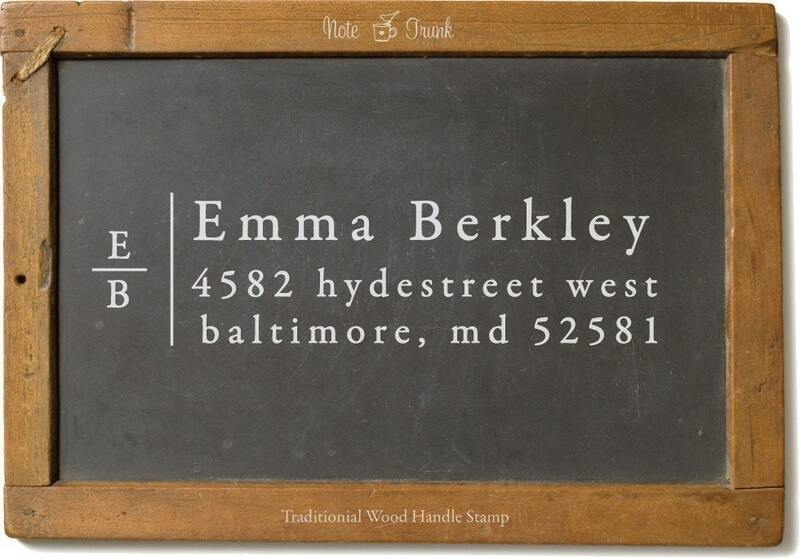 You can use the wood handle stamps from Note Trunk in so many ways - on letters, Christmas cards, even to create your own personalized stationary. 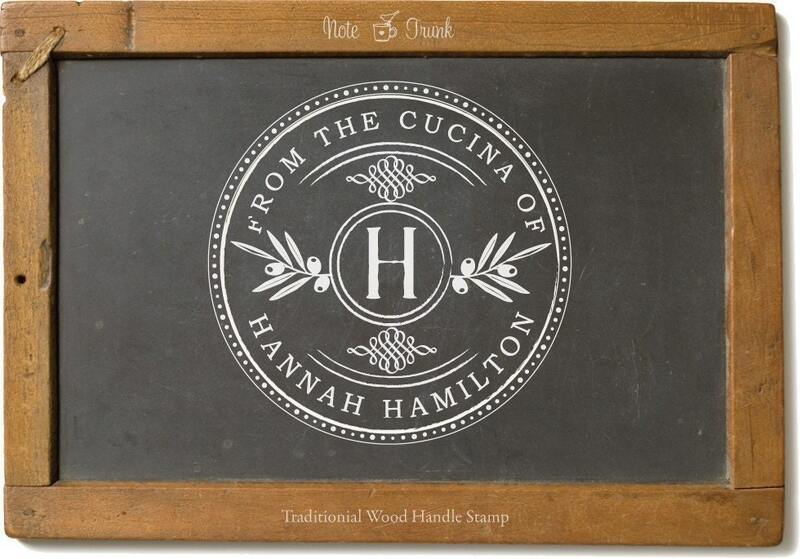 Just buy a stamp pad in any color you want and you customize almost anything. Are you a baker or a cook? Use this stamp to make tags for the tasty treats you give out. Not as into hand stamping as I am? 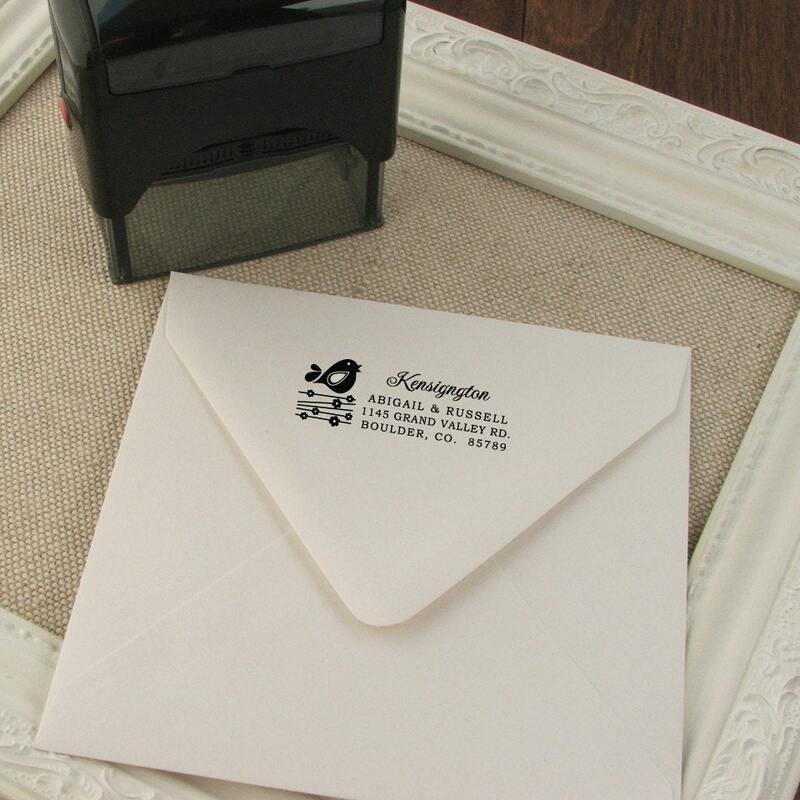 All of the Note Trunk designs come in self-inking stamps as well. 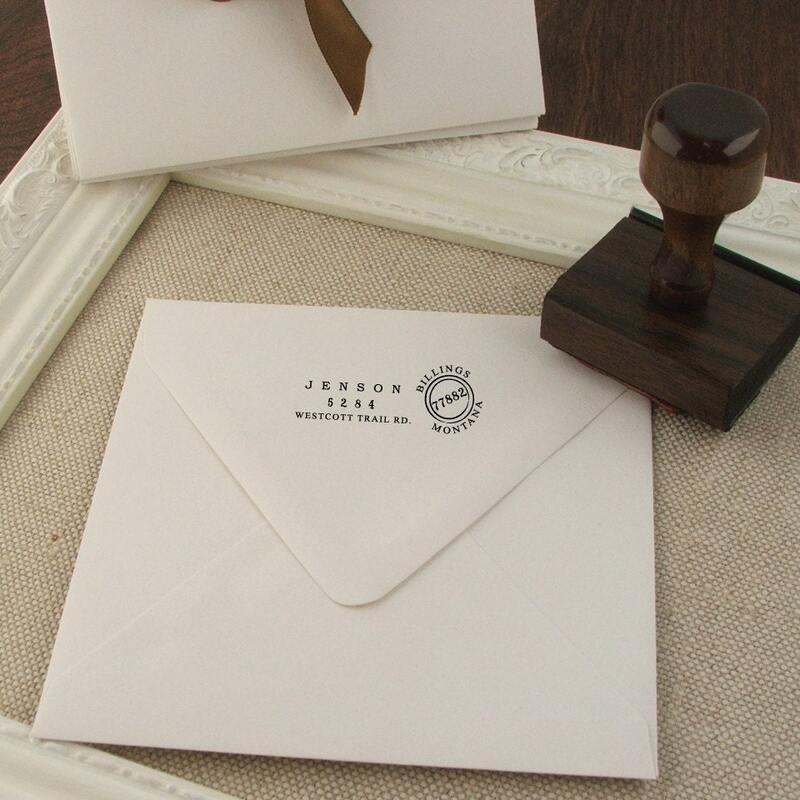 So whether you're more traditional and go with the hand stamp or more contemporary and opt for the self-inking version, Note Trunk has something for you. Now that's stamptastic! 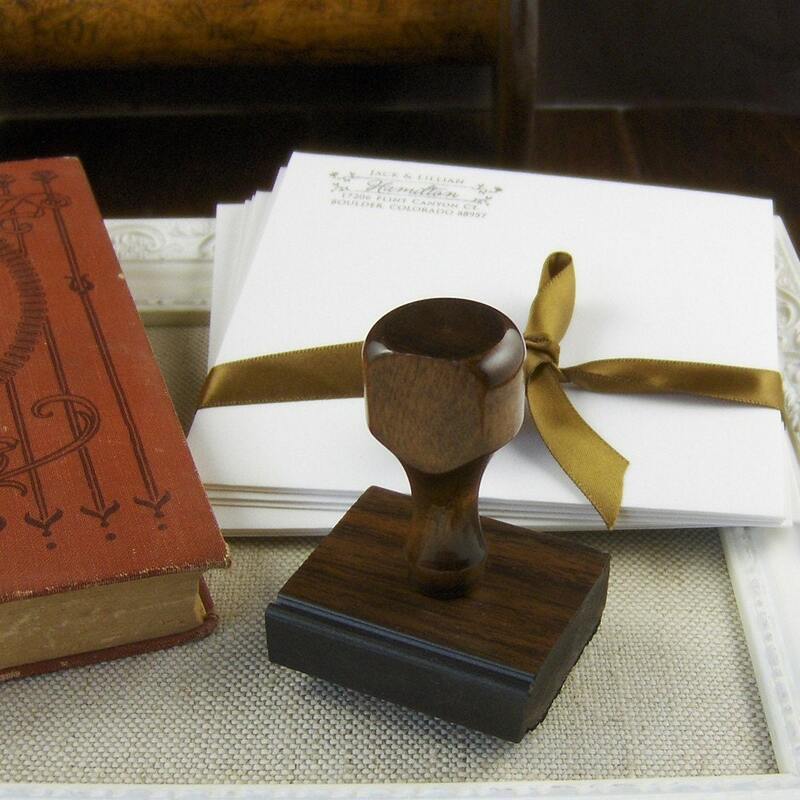 And one of you is going to have to bust out an ink pad because Note Trunk has generously offered to give away a custom wood handle hand stamp to a lucky AFOMFT reader! 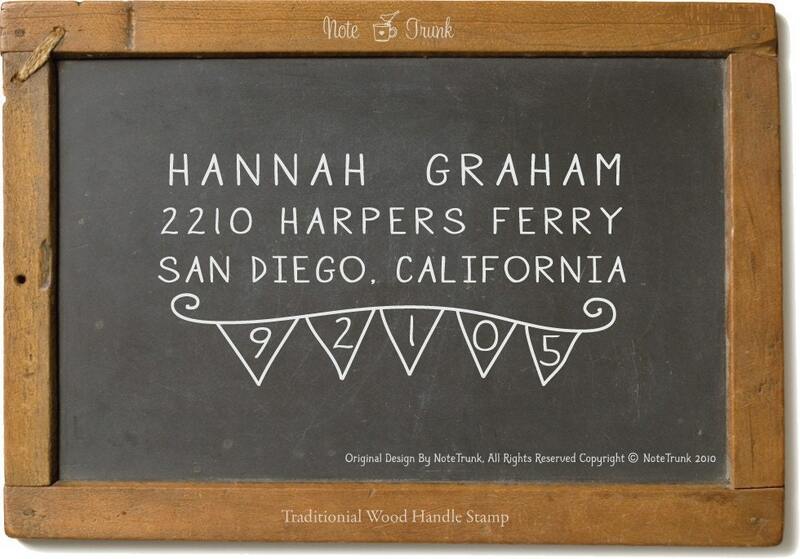 Visit Note Trunk on Etsy and make the store a favorite. Please leave a separate comment for each entry (two if you've blogged about the giveaway) and make sure to include a link to your tweet, blog post, etc. This giveaway is open to residents of the U.S. and Canada and ends March 31st at 11:59 pm EST. The winner will be selected by random.org and announced on AFOMFT on April 1st. If the winner doesn't contact AFOMFT within 48 hours, a new drawing will be held so be sure to check back to see if you've won! Congratulations HEATHER! You've won the bracelet of your choice from pLum! Sassy new spring colors just got added to the shop so you've got a tough decision to make. Please e-mail me at afomft@gmail.com by end of day Friday, March 26th to claim your prize. If I do not hear from you by then, a new winner will be chosen. And a huge thank you to pLum for this wonderful giveaway! Considering how much I love shoes, I really don't like wearing them. As soon as I walk in the door of my house, I kick them off. When I get on a plane, I take off my shoes and slip into a pair of comfy socks. If it wouldn't make my co-workers think I was nuts, I'd probably go shoeless at work too. So when my friend Krissy told me that these slipper socks from Jenster76 Designs are like walking on air, I had to have them. 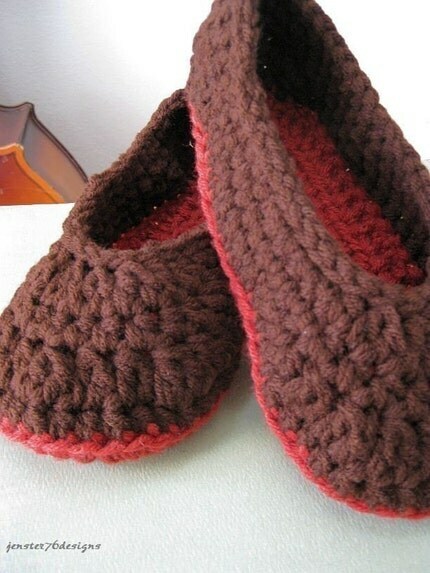 They're named the "Your Favorite Pair of Slippers" and from what I'm told, they more than live up to the name. I love that you can choose any color combo you want. You can even go for a fun mish mash of bright hues. 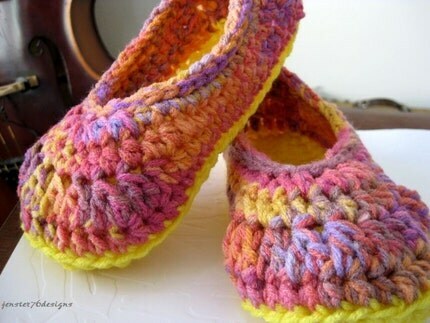 Each set of Your Favorite Pair of Slippers is hand crocheted and can go through the washing machine and dryer. 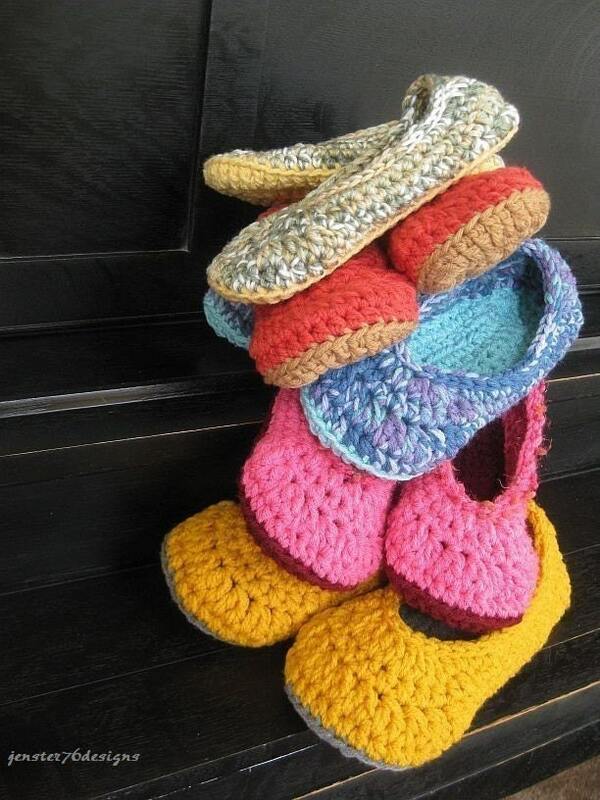 At just $15 each, I have a feeling that Your Favorite Pair of Slippers is going to become my new favorite gift for new mommies, birthdays, you name it. 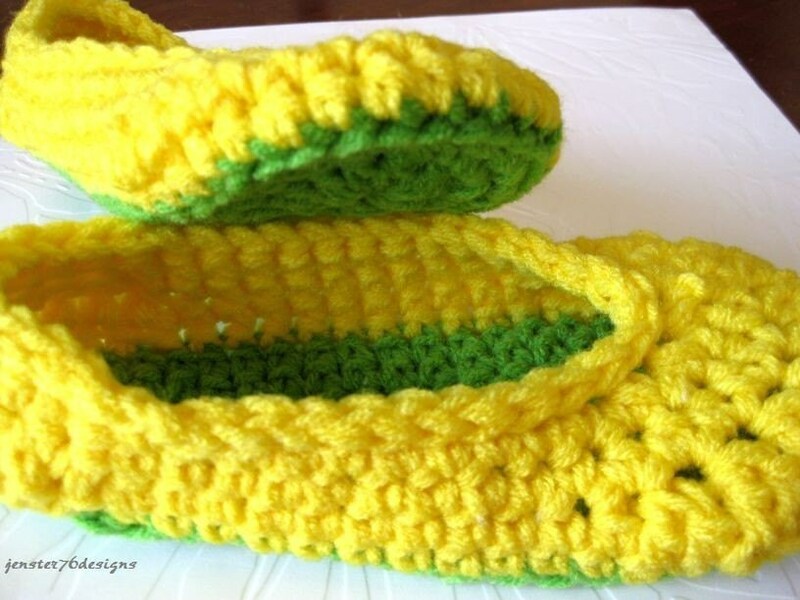 And one lucky AFOMFT reader is going to have the same problem because Jenster76 Designs has graciously offered to give away one pair of Your Favorite Slippers right here! 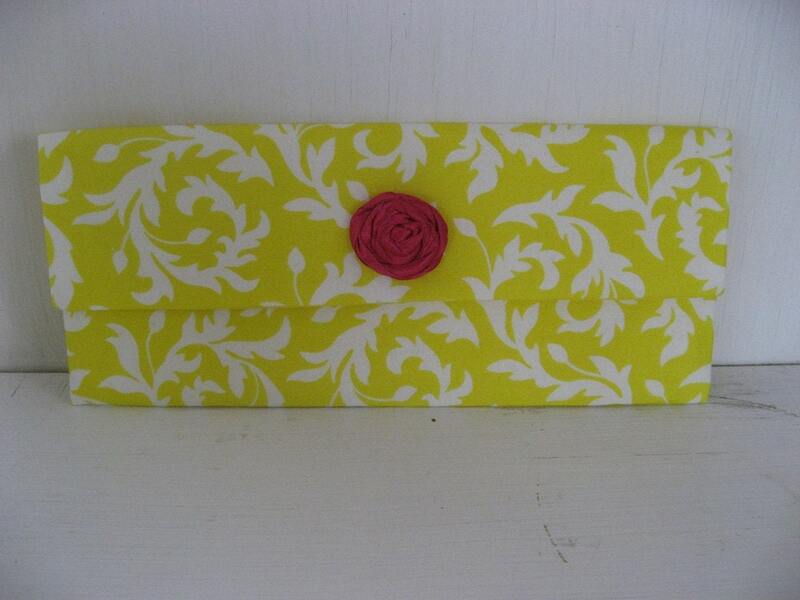 Visit Jenster76 Designs on Etsy and make the store a favorite. Please leave a separate comment for each entry (two if you've blogged about the giveaway) and make sure to include a link to your tweet, blog post, etc. This giveaway is open to residents of the U.S. and Canada and ends March 30th at 11:59 pm EST. The winner will be selected by random.org and announced on AFOMFT on March 31st. If the winner doesn't contact AFOMFT within 48 hours, a new drawing will be held so be sure to check back to see if you've won! Congratulations STRAWBERRY KIDS! 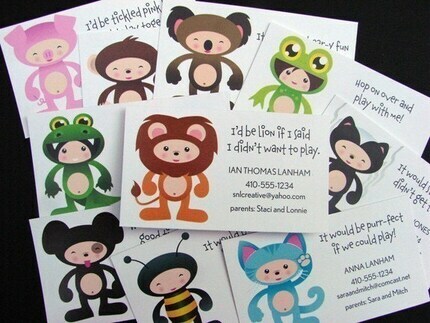 You've won a set of 50 play date cards from Double Buttons! Please e-mail me at afomft@gmail.com by end of day Thursday, March 25th to claim your prize. If I do not hear from you by then, a new winner will be chosen. And a huge thank you to Double Buttons for this great giveaway! Congratulations KIM! 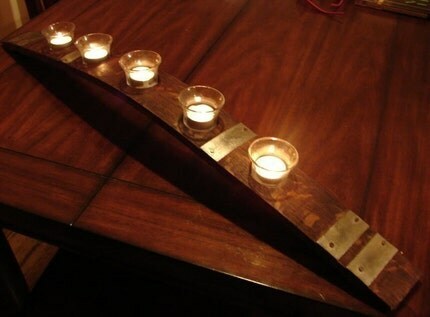 You've won a $35 credit to Wine Barrel Woodcraft to put toward the item of your choice, like this beautiful Wine Barrel Candle Holder. Please e-mail me at afomft@gmail.com by end of day Thursday, March 25th to claim your prize. If I do not hear from you by then, a new winner will be chosen. And a huge thank you to Wine Barrel Woodcraft for this fantastic giveaway! You know that old song from Stevie Nicks called "Leather and Lace?" Well, it's one of my favorites. "Give to me your leather, take from me.... my laaace." The sentiment make sense in the song itself - the woman will take a little bit of her lover's toughness and give him some of her softness because taking a little bit of one another will improve their relationship and a good pair should complement each other. But in real life, I don't want to have to choose between the two. I love leather and I also love lace, and sometimes - like peanut butter and chocolate - I want them both at the same time. And just like Reese's peanut butter cups are perfection when you combine that pair, the cuff bracelets from LemkaB are nothing short of heaven. Is that stunning or what? 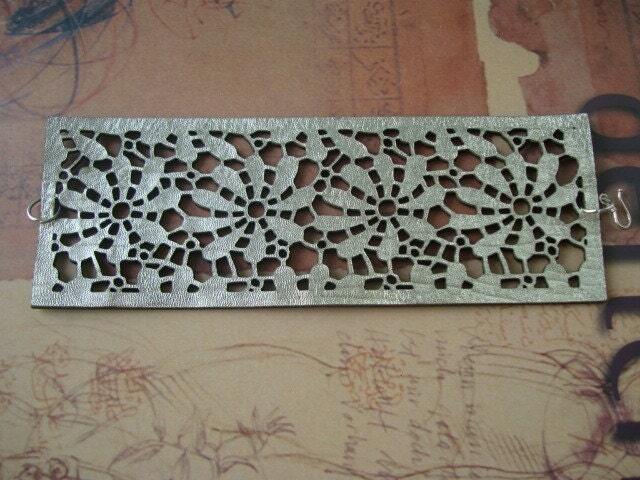 The lace pattern is cut into a leather strip that looks gorgeous even on its own. 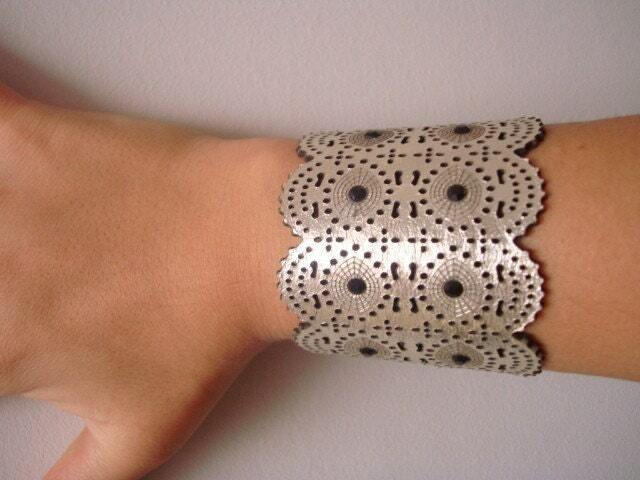 But put it on your wrist and it takes any outfit to the next level. 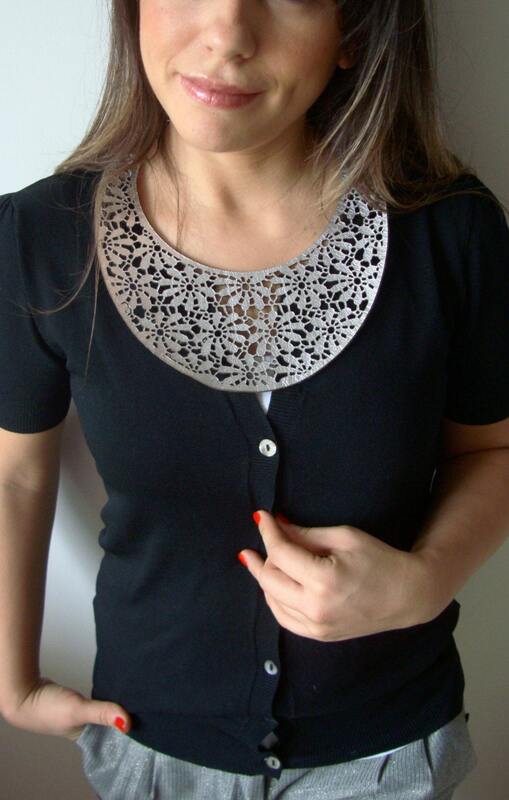 This design is a little less lacy but no less lovely. 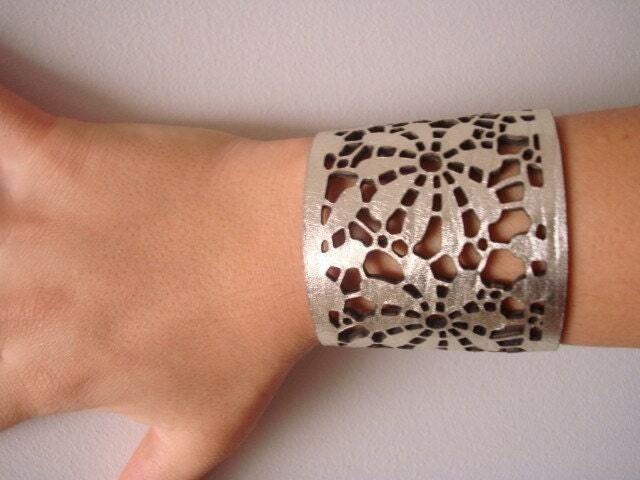 The leather and lace bracelets come in your choice of a gold or silver tone, but that's not all you'll find at LemkaB. 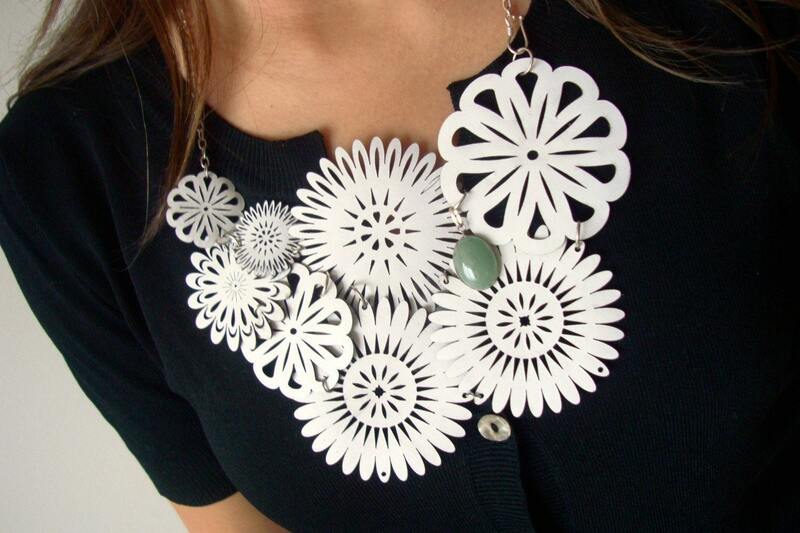 Her bib necklaces are works of art! 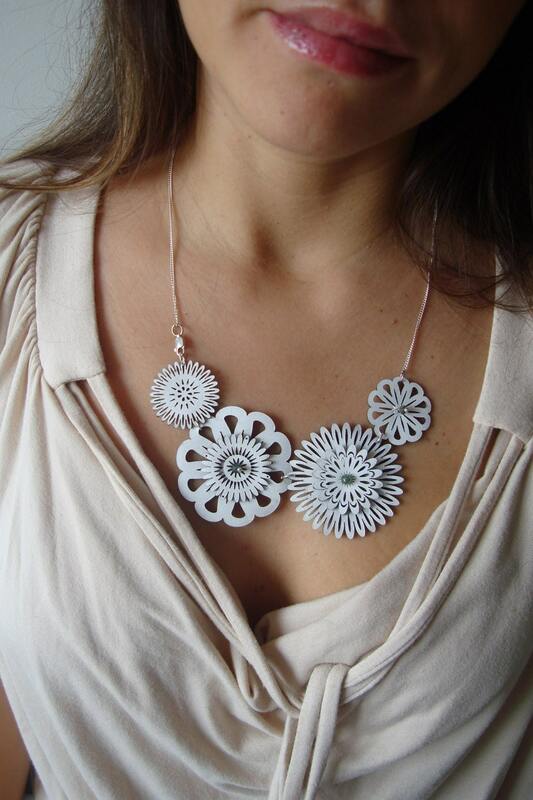 I adore this one, which was inspired by daisies and features eight leather white flowers and a pretty bead accent. 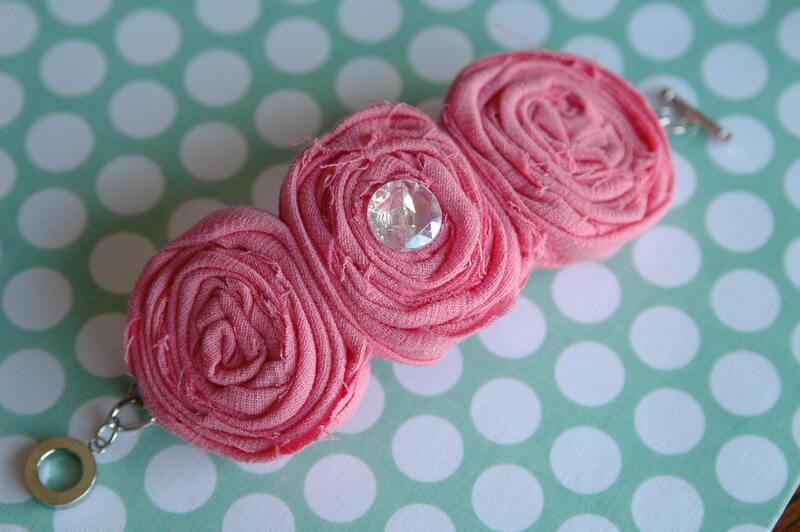 Or if you're looking for something more subtle, the four flower chain is beautiful too. There are also adorable headbands. Just look at the detail work on these bags! 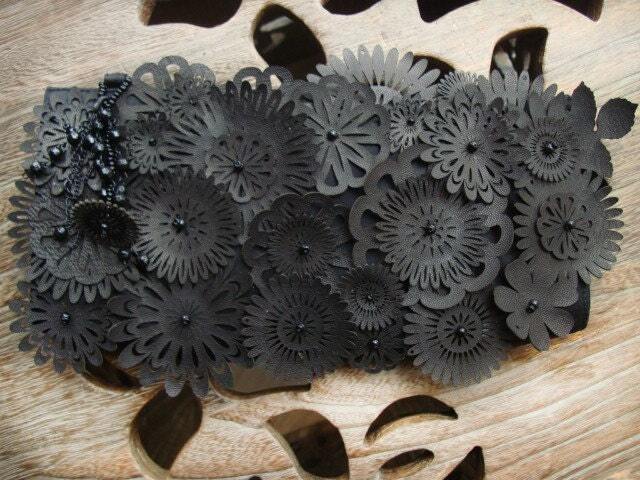 Each one of those flowers is individually cut from leather and attached with a bead at the center. Breathtaking. I am so in awe of LemkaB's beautiful designs. Add any one of her pieces to your wardrobe and you've got an instant update for spring. Oh, and did I mention the prices start at just $25? Steve Nicks was right. Leather and Lace really do complement one another. And since we're talking about great pairings, here's another one. 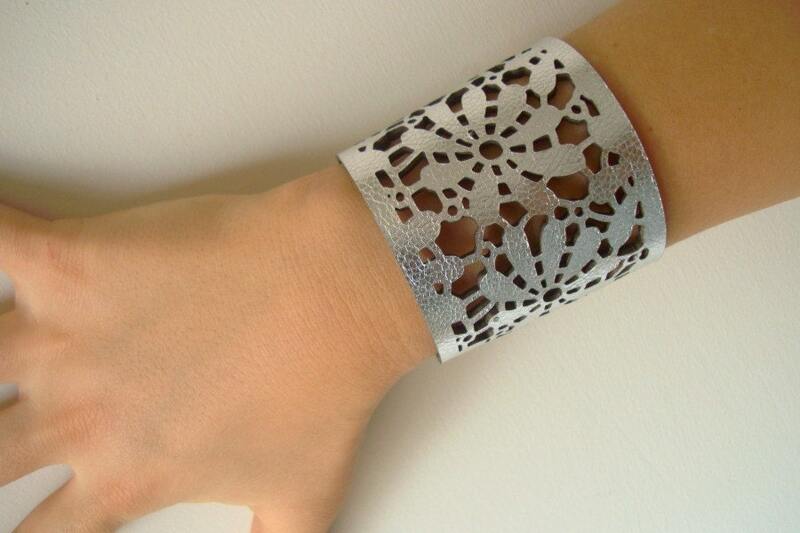 One lucky AFOMFT + a LemkaB cuff bracelet! Now how's that for a perfect partnership? Visit LemkaB on Etsy and make the store a favorite. Please leave a separate comment for each entry (two if you've blogged about the giveaway) and make sure to include a link to your tweet, blog post, etc. This giveaway is open to residents of the U.S. and Canada and ends March 29th at 11:59 pm EST. The winner will be selected by random.org and announced on AFOMFT on March 30th. If the winner doesn't contact AFOMFT within 48 hours, a new drawing will be held so be sure to check back to see if you've won! Anyway, I was reading one of my favorite blogs this week, Scoutie Girl, and came across We Scout Wednesday. The idea is that Tara, the brains behind the blog, writes about a topic on Wednesday and others link up with posts of their own on the same subject. This week's theme is Planes, Trains, Automobiles & Bikes, which immediately made me think of the adorable shirts from Marty May. 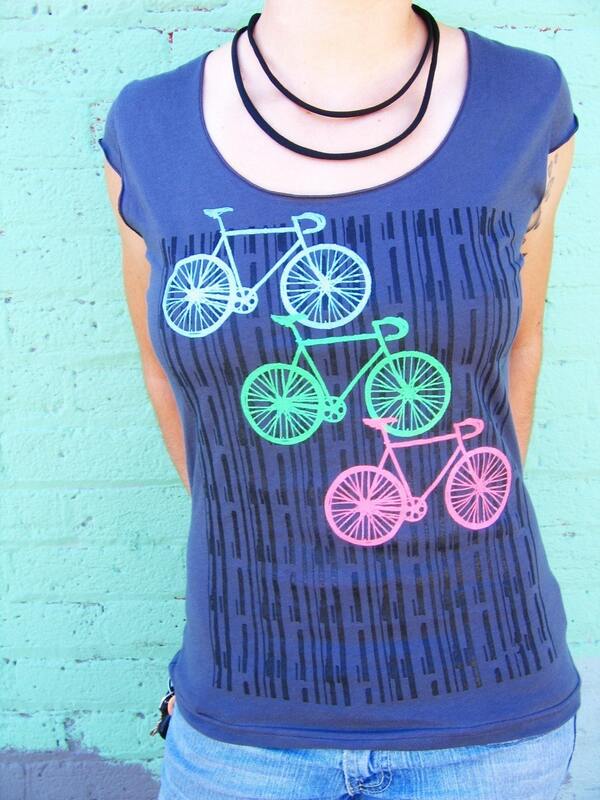 The colors on this Skid on Asphalt tee just make me smile! 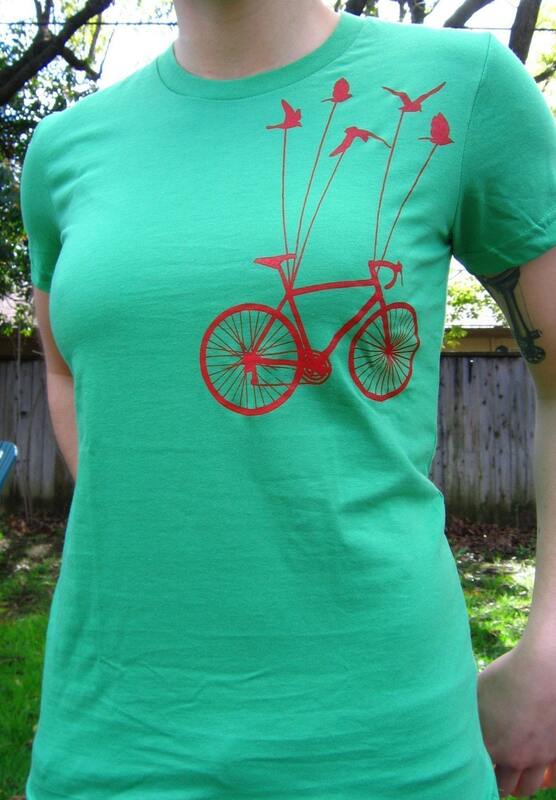 And how sweet are these Flying Bike shirts? 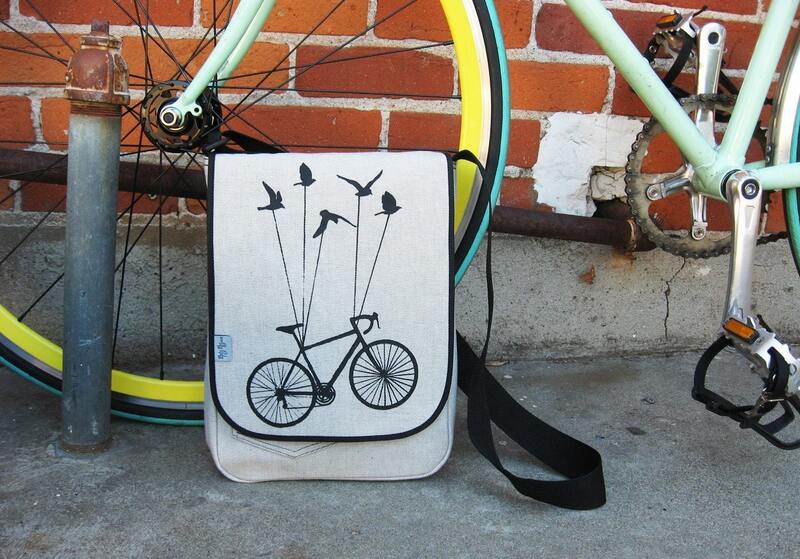 But bikes aren't the only images Marty May puts on her designs. 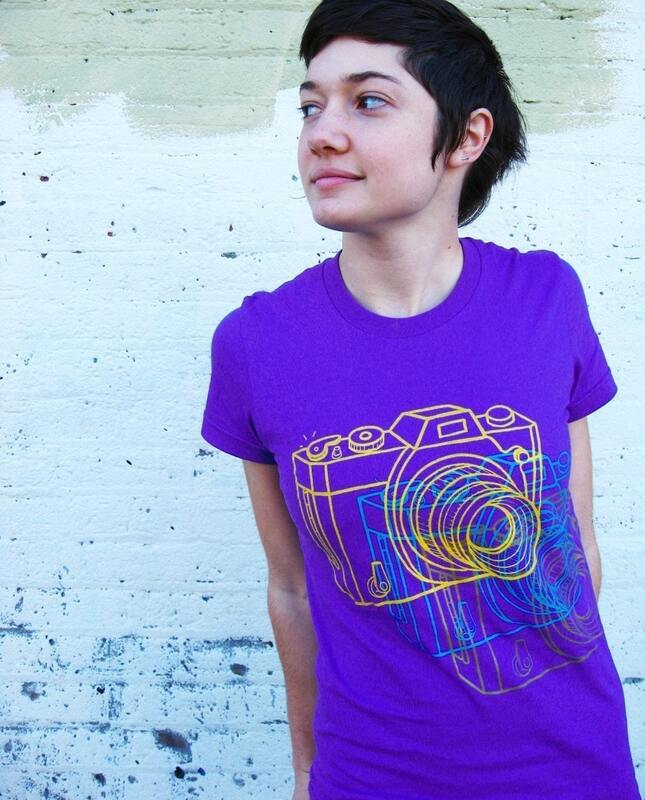 There are cool cameras. Want something with a little more sass? How about the angry veggies? 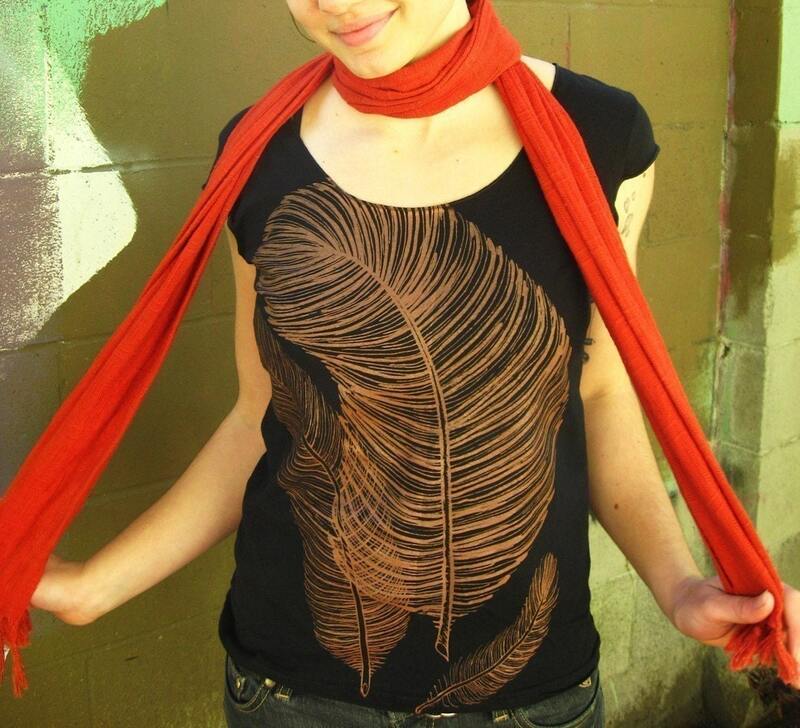 Marty May puts her gorgeous graphics on more than just tees. 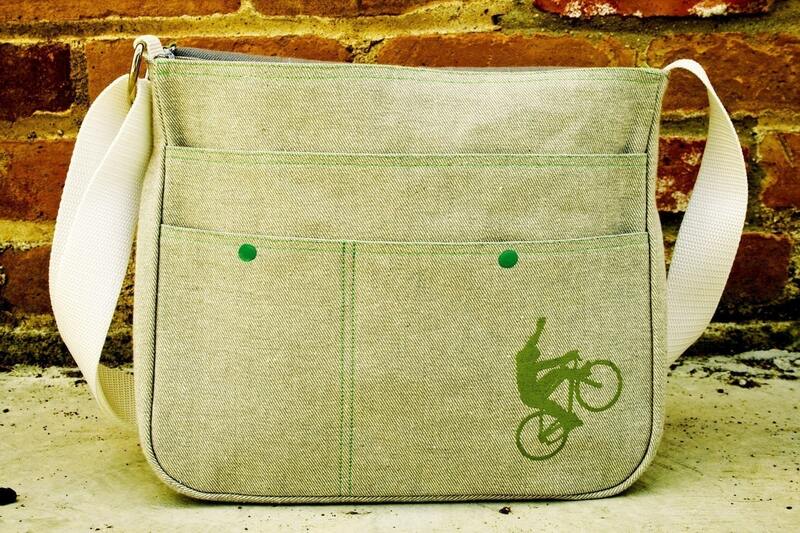 They also dress up messenger bags, like this fabulous grey denim. 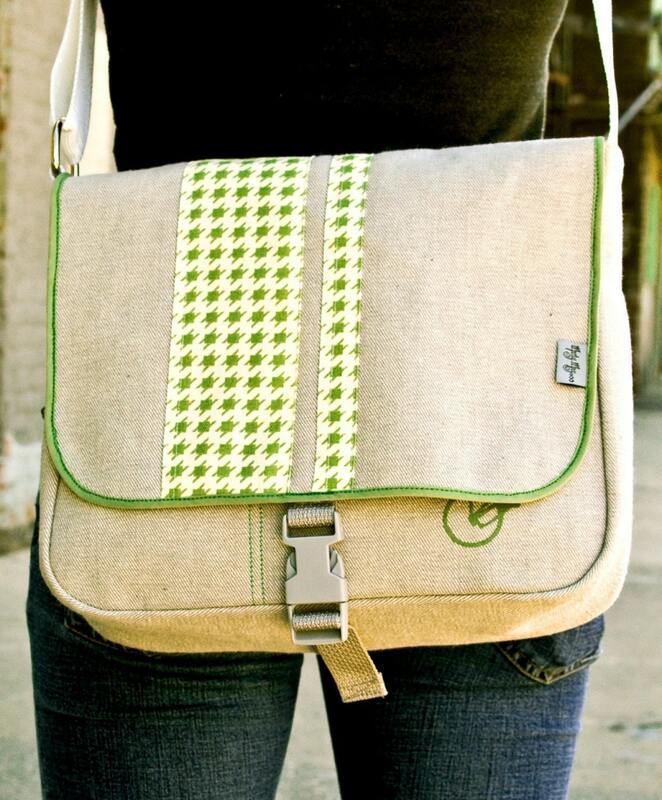 And I adore this green hounds tooth version (see the little biker peeking out from under the flap?). So there you have my first contribution to We Scout Wednesdays. And Mary May's got something to contribute too! That's right. 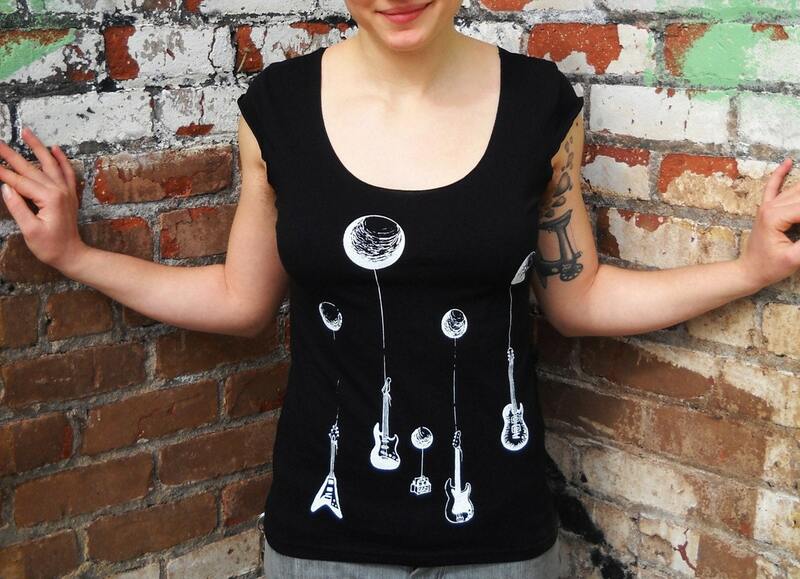 Arty May has graciously offered to give away one of her terrific tee shirts to a lucky AFOMFT! 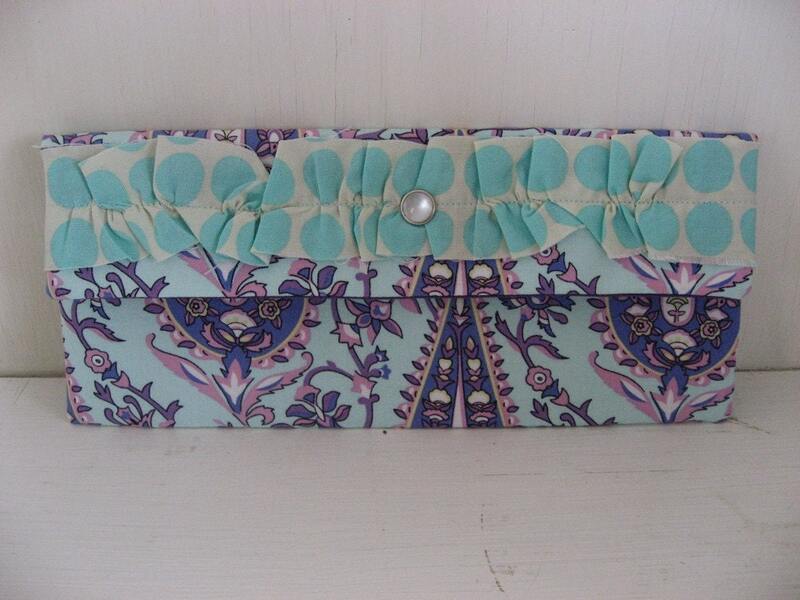 Visit Marty May on Etsy and make the store a favorite. Please leave a separate comment for each entry (two if you've blogged about the giveaway) and make sure to include a link to your tweet, blog post, etc. This giveaway is open to residents of the U.S. and Canada and ends March 26th at 11:59 pm EST. The winner will be selected by random.org and announced on AFOMFT on March 28th. If the winner doesn't contact AFOMFT within 48 hours, a new drawing will be held so be sure to check back to see if you've won! MOM MADNESS MONTH IS HERE!